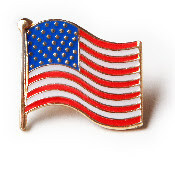 Barack Obama says that he used to wear an American flag pin prior to 9-11, and shortly thereafter, but now doesn’t wear it because it has become a substitute for "true patriotism." Let’s see if I have this right: He wore the pin as a symbol of his patriotism, but following the worst attack against our nation’s homeland, it no longer is a true symbol of patriotism. The reason, he said, is that he saw “people wearing a lapel pin and not acting very patriotic." He’s right, of course, that wearing a pin doesn’t make a person a patriot, but why would the fact that some people who wear the flag don’t act patriotic make Sen. Obama stop wearing his pin? Some people act badly and wear pants: Would he stop wearing pants? See, that’s the fallacy of his argument. And you know, there are quite a few people who wear the pin that do act patriotic. So, there’s another reason for Mr. Obama no longer wearing his flag pin.